TIP: I suggest you to refer Prime Number article to understand the logic. 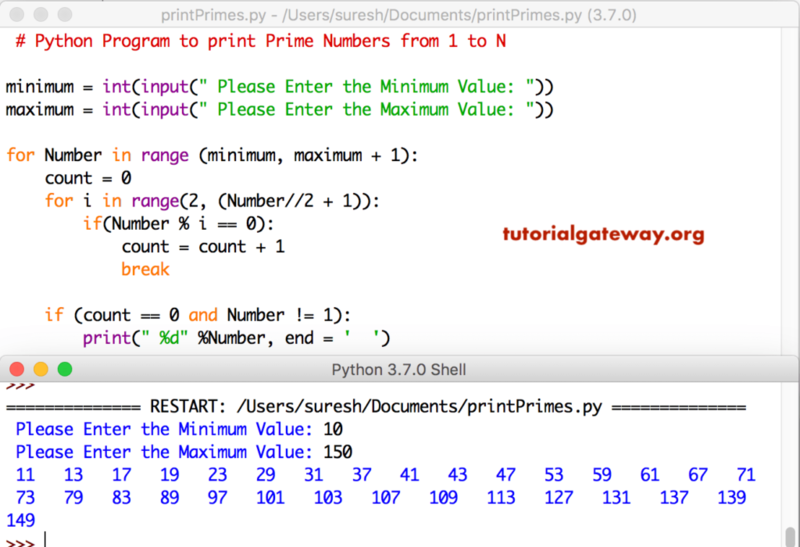 This python program will print prime numbers form 1 to 100. We just replaced the For loop in the above example with While loop. Instead of blindly printing prime numbers from 1 to 100, this program allow user to enter the minimum and maximum values. Next, it will print prime numbers between Minimum and Maximum values. This program is same as above. We replaced the For loop with While Loop. This program finds the prime numbers between 1 and 100. Next, its going to add those number to find the sum of prime numbers between 1 and 100.